A late Andy Cox strike was enough to fire Nyetimber Pirates back to winning ways in the premier division of the West Sussex League with a 1-0 win over Lavant. Boss Ted Griffin made a number of changes to the injury-ravaged starting line-up with Karl Westbrook back in the side at right back after a long spell out with an ankle injury and club record scorers Phil Turner and James Fallick taking up centre-half duties. Pirates started slowly and looked to lack confidence after defeats in the past two weeks which have more than likely left them out of the title race this season. Matters were made worse midway through the first half when Ash Harper saw red, reducing the Looters to ten men. Ten-man Pirates came out battling in the second half and it was difficult to see which team was one player short but they struggled to create any clear cut chances. 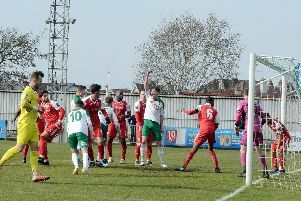 It looked like neither side would break the deadlock until the 80th minute when Cox burst down the right hand side beating the full-back firing the ball into the bottom corner past the Lavant keeper. Lavant pushed on for an equaliser but the makeshift back four stayed strong and managed to hold out until the end. Pirates: Pye, Williamson, Westbrook, Turner, Fallick, B Cox, Wyatt, Pasterfield, A Cox, Harper, Frangou. Subs Haga Hammond, Horn.